Yesterday evening seventy citizens of Pakistan were blown apart by a suicide bomber at a park in Lahore. The death toll will rise. It always does, especially when seriously wounded people are left to the tender mercies of Pakistan’s healthcare system. Many were women and children. Families were enjoying the cool spring weather, taking advantage of a day of rest to push their children on the swings and buy ice creams. It must have been a wonderful time. Then a suicide bomber parked his car near the gate, next to the swings, and detonated his device. Now those same families are ripped apart; their laughter transformed into screams and terror by means of twenty kilos of explosives and a bag of ball bearings. Many of those killed were Christians. They, like my family and me, spent Sunday morning at church rejoicing in the glorious triumph of Easter Sunday, when Jesus rose from the dead and conquered death and sin. They, like us, shared lunch with family and friends. They, like us, went out to celebrate in the evening. Yet we were not attacked and they were. The same people who laughed and rejoiced in the victory over the grave are now, themselves, in the grave. Life beat death, and then death came back in the darkness of a bomber’s heart and in the shape of chemicals and ball bearings. And yet this is not over. After the attack messages started circulating asking for donations of blood for the wounded. A Lahore taxi firm offered free travel to anyone going to hospital to donate blood. People of all religions are united in condemning the attack. The condemnation even united India and Pakistan: the hashtag prayforlahore is trending in India. Hospitals in Lahore are crammed – literally crammed – with people queueing to donate blood. Probably most of them are Muslims. I am crying for gratitude as I type. Still the pain remains. This is a profoundly beautiful and deeply misunderstood country, full of polite, kind, honourable people – and yet a country bedevilled by violence perpetrated by a minority of deranged lunatics who kill indiscriminately. They target Christians, and Hindus, and Shias, and Sunnis, and the Pakistani soldiers who give their lives to protect Pakistani civilians: they are against everyone, except their fellow bigots. And yet they will lose. Pakistanis are too good, too decent, too strong to give in to this mass murder. Love will win in the end, though the path to that victory may be littered with more bodies. Life will triumph over death. Easter is not the end, but the beginning. I seem to make a habit of missing obvious tourist attractions when I travel. I spent a year in Spain and didn’t once visit Barcelona, nor Seville. I grew up in the UK but didn’t visit the Lake District, one of our premier sites of natural beauty, until I was 25. I travelled all around Tanzania and didn’t go to the Serengeti National Park, which is more or less the only thing that the majority of tourists in Tanzania actually DO see. Last weekend I remedied a significant oversight on my part by visiting the Lahore Fort. This is one of Pakistan’s premier attractions and one of its six UNESCO World Heritage sites. Built largely during the reign of Moghul Emperor Akbar, between 1556 and 1605, it occupies a significant chunk of the north western corner of the Walled City of Lahore. We turned up in a rickshaw and were deposited a few hundred yards away from the entrance, since renovation work to the next-door Iqbal Park prevented our rickshaw from getting any closer. First, the positives: Lahore Fort is a really impressive place. It covers a huge area of land and its walls and towers still possess a real sense of grandeur. Entering the Fort entails climbing up a set of shallow, broad stairs which seem oddly disproportionate, until you learn that they were thus built so that Emperors could ride their elephants right into the Fort itself. The walls command an impressive view over Old Lahore. Much of the artwork in the individual palaces and rooms which make up the bulk of the Fort is remarkably beautiful: elegant carvings, fine stone inlays, delicate stone tracery. The skill of the artisans who produced such beauty has to be appreciated. Furthermore, the Fort uses open space very well: fountains and lawns stretch in front of the visitor, fringed with trees. The Lahore Fort put me in mind of the Alhambra, another magnificent Muslim palace with beautiful artwork, fountains, and gardens. And now for the negatives: everything is neglected. It is heartbreaking to see. Magnificent painted ceilings are now stained with damp, their colours faded and worn. Whole sections of delicately inlaid stones depicting elegant floral patterns have been chipped out, leaving gaping holes. The 19th century cannon which stand in front of the Diwan-e-Aam have crisp packets jammed into their muzzles. Most appalling of all is the graffiti: names of visitors scribbled in black marker pen, scrawled directly onto ancient stonework and mosaics. Mobile phone numbers, inane comments, childish insults, etched onto a UNESCO World Heritage site! It is unthinkable. Imagine the outrage if visitors wrote their names in Tippex on Stonehenge or the Taj Mahal – that is precisely what has been done, and continues to be done, at the Lahore Fort. I don’t understand it. This is the premier tourist attraction in Pakistan, a country which, contrary to popular belief, is actually packed with fascinating sights. And yet instead of being revered as an example of Muslim achievement and architectural excellence – which it undoubtedly is – it is scribbled on by idiotic schoolchildren as if it were nothing more than a discarded scrap of paper. Where are the UNESCO funds being used? Not to employ guards, nor to employ guides; not a single one was in evidence. Is it really that difficult to prevent people defacing a monument of international historical importance? Do people here really care so little about their national story? 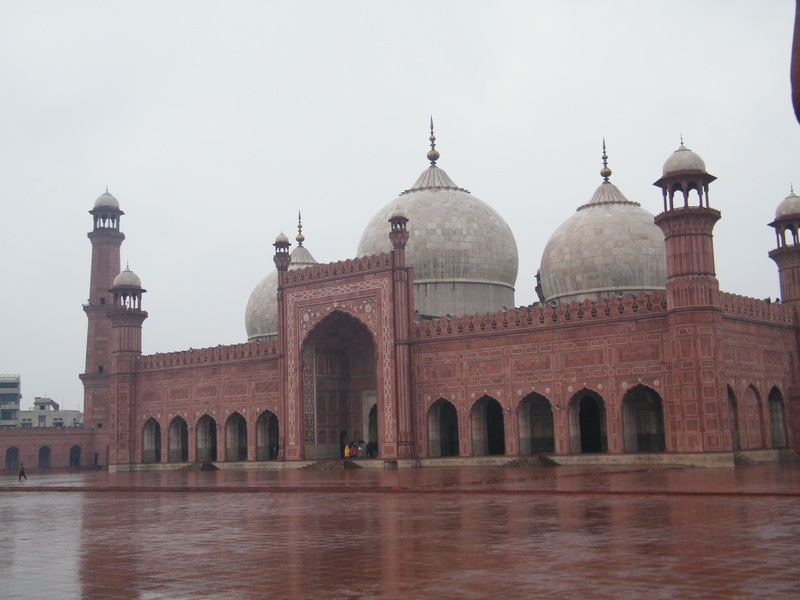 Here’s a confession: I have been to Lahore a total of five times and only recently, on my fifth trip there, did I get round to visiting the Badshahi Mosque. This is strange, seeing as it is one of the premier historical attractions of Pakistan and I am keenly interested in history. Never mind, though – despite my tardiness I eventually got around to visiting it, and I wasn’t disappointed. Its size alone makes it stand out – it is vast, with a courtyard large enough to accommodate some 95,000 worshippers. It was the largest mosque in the world for over 300 years, until it was overtaken by the Faisal Mosque in Islamabad.